Meeting your college roommate used to be one of the anxieties of the first week of school - but if you'd been paired with B.J. Leiderman, who writes our theme music. 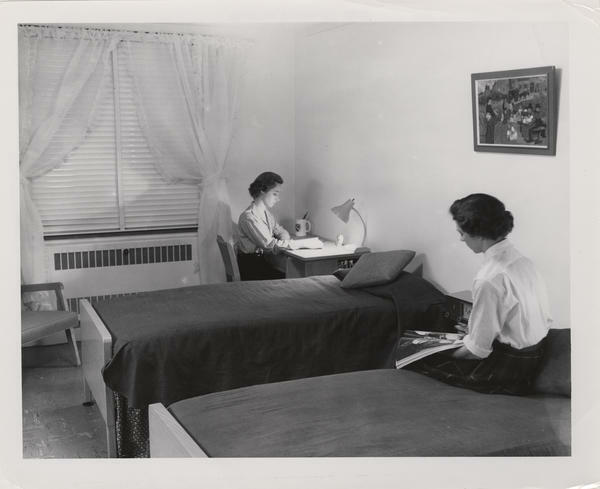 But these days, many freshmen meet in advance online and arrange to room together. Now some schools have decided to bring back largely random pairings. Duke University announced their change earlier this year. Larry Moneta is Duke's vice president of student affairs and joins us from Durham. Thanks so much for being with us. SIMON: And why did Duke decide to make this change? MONETA: Well, we have a pretty distinctive first-year experience where we have worked hard to create an environment where students really get to know people who are different from themselves. And we'd watched over the last several years when an increasing number of students were preselecting roommates, taking advantage of social media or friends from home or - and it began to become a much larger percentage of the class than we would have liked. There was more homogeneity among the students who chose their own roommates. And so we just reached the conclusion that students would be best off, for the most part, going back to a random assignment process. SIMON: Well, what was wrong with students finding each other and seeking - I'll say compatability rather than homogeneity. MONETA: Well, I wouldn't put it on the top 10 list of things that kept me up at night. But to the extent that we're being very deliberate about the kind of first-year experience that we think would best suit our students, we just thought that this would be a better approach. SIMON: I wonder what you think about this, Mr. Moneda. A quick online search will show you that there are schools across the country - and I'll just rattle off the earliest ones - U of Colorado, Boulder, Cal State, Los Angeles - where African-American or lesbian, gay, and transgender students, usually at the request of students, ask to room together. There are even all African-American dorms at some schools. What do you think of that? MONETA: I think there is not a one-size-fits-all model that works for every school. And this is not to suggest that the only way roommates will occur is by letting the computer do the assignments. What we're dropping is the self-selection by a student of another student. If there's a unique need where we have to accommodate a student of color, the system will permit us to do that. And we'll still make sure that no one is in a situation that's incompatible or uncomfortable for them. Well, uncomfortable maybe but not incompatible. SIMON: Do you at Duke make some effort to get people of different backgrounds together? MONETA: We do. We don't want to force it. I don't want to put a student of color in a position of having to be the educator of a Caucasian student. I don't want a gay student to feel like their job is to educate students who have not been exposed to gay students. But we would like the experience to be one in which students are going to encounter the full range and spectrum of the kinds of students we're admitting. SIMON: What kind of reaction have you had on campus so far? MONETA: Overwhelmingly positive both on and off campus. You know we've certainly heard from a handful of the incoming class who thought they were coming under under one set of conditions. But I would say dramatically higher percentages of existing students, alumni, parents who've all said this is a good thing. This is what college is all about. SIMON: What about the food in Duke? Is that your next frontier? MONETA: Actually, we are arguably the best food program in the country and getting rave reviews from our students. So when students rave about food, the only thing left is for the faculty to rave about parking. SIMON: (Laughter) Larry Moneta is vice president for student affairs at Duke. Thanks so much for being with us, sir. (SOUNDBITE OF SLEEPING STATES SONG, "RIVERS") Transcript provided by NPR, Copyright NPR.